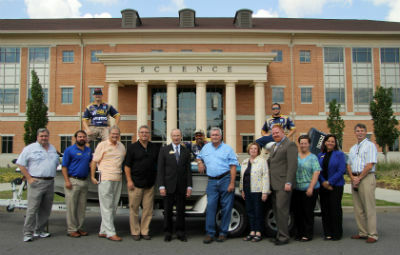 SAU President Dr. David Rankin, standing fifth from left, accepts a fishing boat from SAU alum Fred Eason, sixth from left, recently in front of the SAU Science Center. Eason’s boat donation makes SAU’s fishing team the only other college fishing team besides UofA that has a fishing boat. Also pictured are SAU fishermen, sitting in the boat from the left, John Wofford, Kevin Roberts and Will Reeder; standing from left, SAU biology faculty members Tim Daniels, fishing faculty advisor Pablo Bacon, and Dr. Claude Baker; David Sargent; Rankin; Eason; Jeanie Bismark and Josh Kee of the SAU Foundation; Sandra Hughes, fishing team advisor; SAU Vice President for Student Affairs Dr. Donna Allen; and Eldon Boch. MAGNOLIA – Thanks to the generosity of a Southern Arkansas University alum, the Mulerider fishing team has reeled in its biggest catch yet. Fred Eason, 1969 SAU political science graduate, recently visited his alma mater towing a blue and gold striped boat. SAU fishermen and University representatives welcomed him with wide-eyed excitement. SAU now joins the University of Arkansas as the only two university fishing teams in Arkansas with their own boats. Eason has done well with his SAU education. He is currently chairman of the board of Delta Trust Investments, Inc., a Mossy Oak Properties agent, and president of Eason LaRoche Holdings, Inc. In his leisure time, he hunts, fishes, and writes books. He said that movie producers are currently reviewing his latest book, 500 Miles to Nowhere: The Legend of Bass Reeves. Eason had been following the stories of the SAU fishing team’s success, and while reconnecting with the SAU Foundation, the devoted fisherman decided how he could give back to SAU. He knew his idea was meant to be when he realized that his 2001 Ranger 21” fishing boat with 225 horsepower Yamaha outboard motor fit perfectly with the Mulerider blue and gold. SAU has shot up the college fishing team rankings since the team was formed in 2011. It is likely this fast boat will propel the Mulerider anglers toward more success. John Wofford was on hand to thank Eason for the donation. Wofford and teammate Adrian McFadin will put Eason’s boat to good use at the beginning of October when they participate in the National Guard FLW College Series Invitational on Lake Sam Rayburn in Texas. Wofford qualified the team for this big tournament by landing two big catches in last season’s Cabelas Big Bass Bash in Branson, Missouri. Had SAU enjoyed such fishing success when Eason was a student, he would have written about it in the University newspaper. He recalled his days as co-editor of the SAU student paper, The Bray. Originally from Camden, Ark., Eason attended Harmony Grove High School. While visiting with Dr. David Rankin and other SAU representatives in the lobby of the beautiful SAU Science Center, Eason admired the growth of the University.